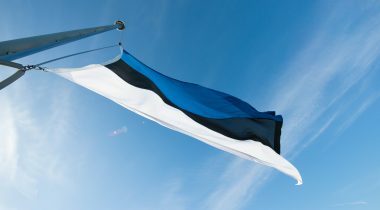 Today at 9.09 a.m., the 100th anniversary of raising of the blue-black-and-white flag as the national flag of Estonia on the Tall Hermann Tower is celebrated at the Governor's Garden. President of the Riigikogu Eiki Nestor will deliver the welcome speech. “100 years ago, the Tall Hermann with the blue-black-white flag became one of the most important symbols of our country,” Nestor stated. At the festive ceremony, historian Küllo Arjakas will recall the hundred years that have passed. The Orchestra of the Estonian Defence Forces, conducted by Lieutenant Simmu Vasar, and the choir of Co-education Gymnasium will perform at the ceremony. The ceremony will be attended by representatives of the constitutional institutions. An exhibition dedicated to the national flag of Estonia is opened in the lobby of the Riigikogu Building today. In the renovated Governor’s Garden, an information board giving a short overview of the history of the Tall Hermann Tower, the procedure of raising and lowering the national flag, and the meaning of the colours of the flag has been placed at the foot of the Tall Hermann Tower. This summer, the Governor’s Garden at the foot of the Tall Hermann Tower underwent a thorough renovation. The low vegetation, paths and lighting of the Garden and the solution for rainwater drainage systems were renewed. The existing garden walls were repaired and an additional wall for sitting was built. Benches and litter bins were placed in the Garden, and a bike parking rack was constructed. The Garden was renovated by Tarrest LT OÜ. The cost of the project was nearly 64,000 euro.